Our family ate here last Saturday evening on a quick trip to the mountains. The kids loved it, especially the name. The meal was enjoyable, though not above average. There was not much of a crowd, so we got a table in back overlooking the creek. The rest of the place seemed dark and a little dirty by comparison. As far as the food, they served us large portions, had a large variety of side dishes, and all three of their sauces were quite good. My husband,daughter and myself ate there last year. It was a neat place. It started raining when we were there and the tin roof on the back porch is a nice touch. The food was great and service good. My daughter who is 9 was embarrassed by the name, even after we explained it. 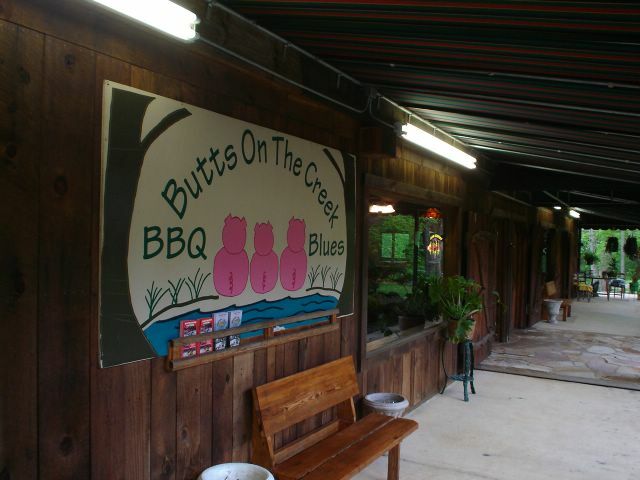 We will eat there again next time we're in Maggie Valley.